At least 1GB RAM, 1.6GHz dual-core CPU or better. Freeware. Free for commercial and non-commercial use. In Windows 8 Microsoft provides its own Metro-style application called Windows Reader for viewing Adobe's popular document format. Windows Reader presents a very simple full-screen experience, like other Metro-styled apps. However, if you need more functionalities or need to collaboratively work with other native applications on the same desktop, you would definitely need a native PDF reader. PDF Viewer for Windows 8 is such a reader that offers decent capabilities and performance as well as versatile functionalities as a native application and is extremely useful for those that typically stick to the Windows 8 desktop experience. 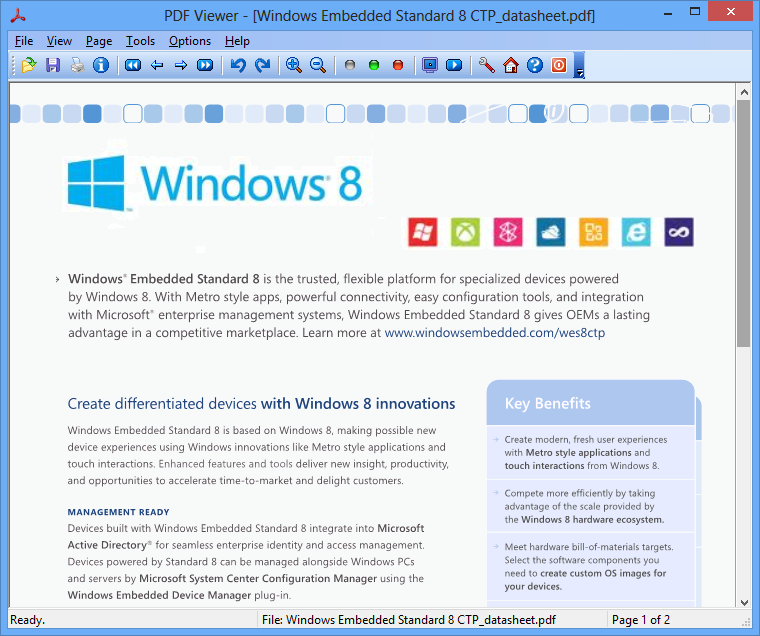 PDF Viewer for Windows 8 sports three reading modes, Fit Page, Center Page, and Continuous. In Center Page view, only one whole page will be seen at a time and you must use the navigational controls to move from page to page. In Fit Page view, PDF Viewer will display one page of the current document at screen height page by page. In Continuous view, only one whole page will be seen at a time, but you can scroll through the document continuously, with the start of the next page being visually attached to the end of the current page. Interestingly, navigation varies depending on which view mode is used. In Continuous view, you can swipe left and right, use the left and right arrow keys, or click the pop-up, browser-like navigational controls that appear to move through the document. But in Center Page and Fit Page view, PDF Viewer behaves like a traditional document-based, traditional Windows application and utilizes vertical navigation instead. In this mode, you can move through the document by pressing PAGE UP or PAGE DOWN key, or by utilizing the scroll bars that appear on the right side of the application. Zooming works as it does elsewhere: with Delete (zoom out) and Insert (zoom in) keyboard shortcuts, or from the menu, you can zoom to any percentage. You can optionally rotate the current document clockwise or anticlockwise. PDF page can be viewed in different angles thanks to the fast rotation algorithm. Scroll your mouse wheel up and down to view PDF pages. Make pdf documents be read at the screen width, or screen height, or actual size. Native PDF viewer maximizes your desktop user experience without the need to switch between Class UI (Windows Desktop) and Metro UI (Slate). Convert PDF to TXT, PDF to JPG, PDF to GIF, PDF to PNG, PDF to BMP, PDF to EPS, PDF to WMF, PDF to EMF, PDF to TIFF page by page. PDF files with Asian, Hebrew, Arabic et al fonts can be opened and viewed without difficulty. Unicode support for worldwide languages. PDF document can be viewed in slide show and/or in full screen mode. Text and images in PDF document can be extracted and saved to the location of your preferences. Unlike some other free PDF reader, this feature available in our PDF Viewer is totally free! PDF Viewer doesn't provide editing capabilities, per se. But you can crop or copy the entire content on any page as a high-resolution image, and then paste the image to other applications. Rotation changes are not saved. PDF Viewer is a light-weight PDF reader, only 1 MB in size, and it performances a lot faster than Adobe Reader and Windows Reader. PDF Viewer for Windows 8 is backward compatible with Microsoft Windows 7, Windows Vista, and Windows XP. How to make vertical scroll bar visible and support mouse wheel scrolling between PDF pages? Open a PDF document of 2 or more pages, and then click the Create PDF Document label on the upper-right corner of the PDF Viewer window. The label will be removed, and the vertical scrollbar will appear, and now you can scroll your mouse wheel to navigate between PDF pages. All products support Microsoft Windows 8 64-bit (x64) and 32-bit (x86), Microsoft Windows 8.1 64-bit/32-bit, and are backward compatible with Microsoft Windows 7, Vista, Windows XP, Windows 2000, Windows Server 2003, Windows Server, 2008 and Windows Server 2012.